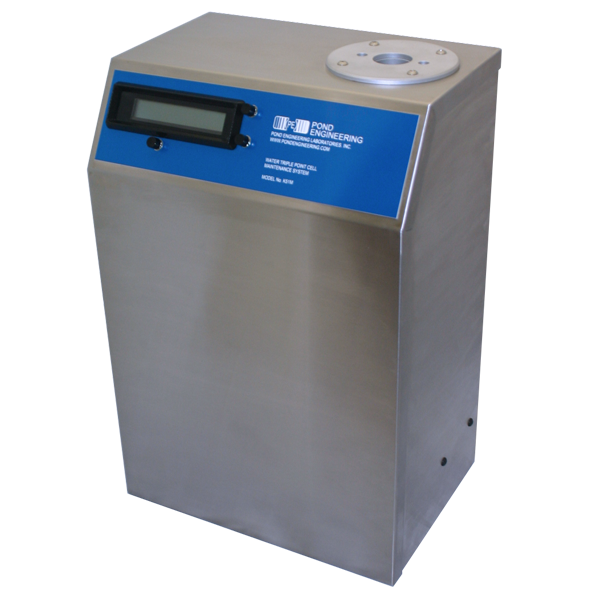 K51 Compact TPW Maintenance System — Pond Engineering Laboratories, Inc.
Nearly all precision thermometry requires frequent realization of the Triple Point of Water (TPW). All ratiometric calculations using Standard Platinum Resistance Thermometers (SPRTs) are based on this defining fixed point. Pond Engineering designed the K51M to simplify the realization procedure, providing a practical fixed point and comparison foundation for your calibration needs. System prompts and audio alarms walk users through the "super-cool and agitate" mantle formation method with a few clicks of a button. 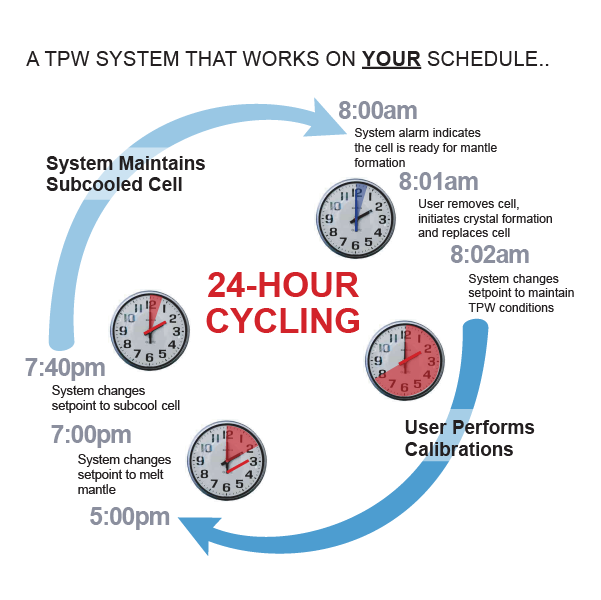 24-hour cycling commands allow users to configure the system to melt and sub-cool a cell overnight and have it ready for mantle formation at any specified time each day. Alternatively, a user can take the system from power-up to realization in less than an hour and maintain a stable mantle for calibration for 8 hours or more. With greater immersion depth than any competing "mini" cell system the K51M compact model dramatically improves performance of industrial probes. The immersion profiles on the back of this sheet illustrate the difference even a few centimeters can make. Solid state thermoelectric cooling ensures long system life and rapid response to setpoint changes. The system also includes three comparison block inserts allowing users to perform precision comparisons from -15°C to 122°C (including the crucial Gallium point). User-friendly features like fully interactive controls on a sloping front panel and cooling air flow directed to the rear of the unit (away from the user) improve usability. The stand-alone compact model fits easily on standard benchtops. Other standard features include a microprocessor controller and universal input power supply, compatible with virtually any commercial AC power worldwide. Interactive control sensor calibration functions make it easy to maintain optimal performance over time.